The miller’s art lies in producing flour with precise characteristics that meet the standards demanded by the market despite having to handle highly variable ingredients. Even same variety of wheat may change from year to year depending on the harvest, climatic conditions and the country of origin. Skilled millers can handle unexpected events and changes, especially they can rely on large, avant-garde plant and storage silos, as is the case for our Arcole mill. Selecting the grains to grind is our first step towards quality. The kernel is the grain of wheat. A high average kernel weight is an indicator of high yield during the milling process because the size of the grain affects the percentage amount of flour free of impurities obtained from the crushed grain. Average kernel weight: 35 – 45 mg. This parameter is used for ISQ classification; it is acceptable when higher than 75 kg/hL. The resistance opposed to crushing by the kernels. Wheat is classified as hard (over 70), providing flour suitable for baking biscuits, medium (between 45 and 70), yielding flour for slightly leavened loaves and dough, and soft (under 45), giving flour used for well-leavened products such as Panettone and Pandoro. Percentage protein content: equal to or higher than 14% for very strong wheats, 13% for strong wheat used to make bread and 11% for plain flour. c) store grain optimally until ready for use. 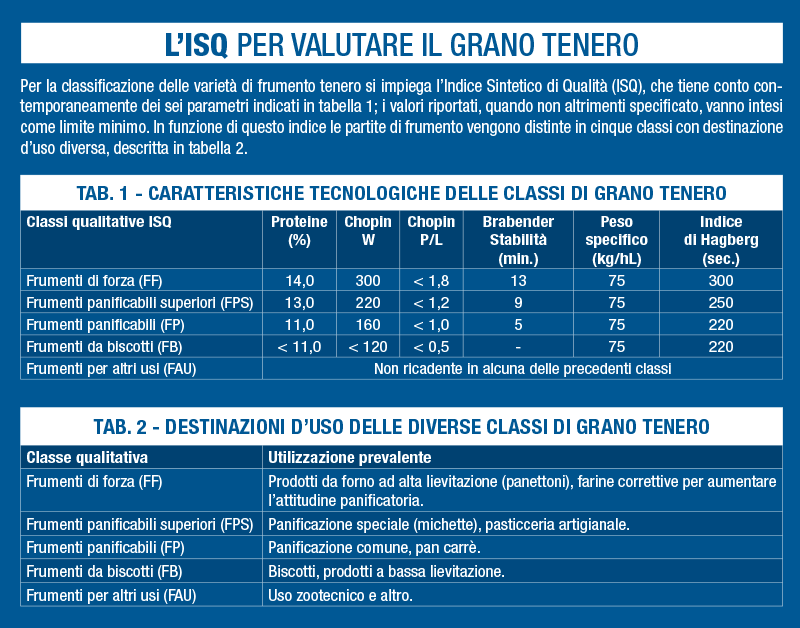 This is why Macinazione Lendinara has 24 storage silos of different capacities and sizes. In this way, we can buy and store different types of wheat in order to create the best o more particular blends, with significant competitive advantages in terms of quality and price. The journey from the field of wheat to the mill to produce flour is long and adventurous. External agents of various kinds, particular climatic and environmental conditions and the proximity of other crops may contaminate our ears of wheat from the moment they bud through the harvest. When wheat arrives at our mill, our technicians carry out an initial visual and sensory inspection; samples are then taken for preliminary analysis of specific mass, protein, moisture, gluten and checks for mycotoxins. If the batch of wheat passes these tests, it is sent to the relative unloading trenches. The wheat then undergoes a pre-cleaning process involving a separator magnet that detects metal foreign bodies and a fan sieve which eliminates impurities, empty seeds and chaff. – Wheat wetter, a key step to ensure optimal wheat moisture. After wetting the wheat for the time, it is left to rest in the five first conditioning cells, before performing a second wetting and conditioning operation. The ideal humidity percentage for milling is 16.5% – 17%. Starchy wheat (also known as soft wheat) are low fermentation grains that absorb water quickly. Hard wheats have a high protein content that make water penetration slower. In order to moisten the wheat uniformly, it must be placed in a wetting cell for 16-20-48 hours, depending on individual requirements. Safety is the most important aspect. Safety is our priority and is why we have equipped our mill with an optical grader and a peeler to ensure excellence in our product controls. The optical grader is based on highly sophisticated technology and is able to isolate damaged and germinated grains as well as allergens using compressed air streams. The peeler performs a mechanical task on wheat grains intended for grinding and significantly reduces any bacteria and pesticide residues. This is the key moment in our work and involves alternating milling and sifting steps. The grain passes over roller mills and is then carried by an air-operated system to the plansifters – large sifters that separate flour and fibre on the basis of particle size. The larger groats are returned to the crushing mills, while the thinner groats pass through the purifiers for cleaning and then they are ground again. Groats still having traces of bran pass through so-called stripping mills, until the grain is completely separated from the chaff. Our plant is divided into 2 sections respectively capable of grinding 360 and 220 tonnes of wheat in 24 hours, for a total of 600 tons of wheat per day. The various basic flours produced are sent to homogenisation cells and then transferred to storage silos. To ensure greater flexibility in the formulation of flours and achieve constant and precise results, the Arcole flour mill was designed and built with 44 flour cells, 14 of which 14 are directly connected to the mixing system. The mill essentially grinds single varieties of wheat; this means that, during the delicate blending stage, our technicians are optimally able to exploit the characteristics of each variety. During the entire production cycle, our technicians keep a close eye on progress, assisted by cutting-edge tools, to ensure the product safety thanks to control plansifters, pest centrifuges and magnets to ensure products free of any impurities or foreign bodies. Our internal quality control laboratory relies on three highly specialised figures who are able to simulate the performance of flours in relation to fermentation and baking. This specific analysis highlights the basic features of the product and, consequently, its intended use in relation to the specifications required by customers. The P:L ratio is used to assess the balance between the tenacity and extensibility of the flour: the optimal value for this ratio is between 0.40 and 0.70. Absorption: the amount of water needed for the dough to reach the optimal score of 500 B.U. Development of the dough in minutes: time needed to reached maximum dough consistency. Stability: maximum dough consistency degree retention time. High quality flours and doughs ensure very high stability, thereby allowing long fermentation and prolonged mechanical stresses. Degree of softening: measures the extent of dough shredding. This tool measures the resistance that the dough offers to a deformation force. It measures the index of Resistance, Extensibility and Energy.